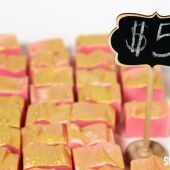 Today, Holly Port from the Lotion Bar Café is sharing a fun and colorful bath fizzy recipe. 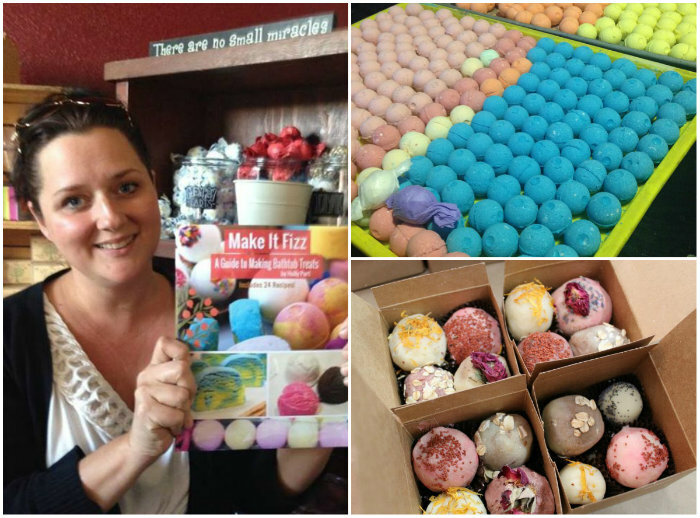 Holly is a bath bomb expert and other of the book, Make it Fizz: A Guide to Making Bathtub Treats. 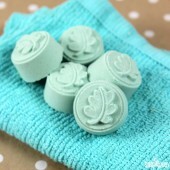 This bath bomb tutorial involves making a mini bath bomb, and embedding it into a larger bath bomb mold. 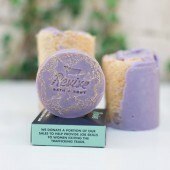 When placed in the tub, the fizzy has two layers of color. 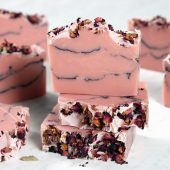 Holly also shares her story on how she got started making bath fizzies, and the tips and tricks she has learned after hundreds of batches. 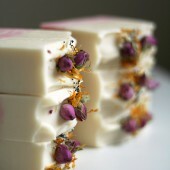 -A.M.
Hi Soap Queen readers! 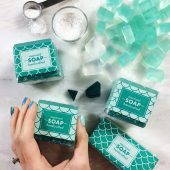 I’m Holly Port, author of Make it Fizz: A Guide to Making Bathtub Treats and owner of Lotion Bar Café in Colorado Springs, Colorado. Mother of two teenage boys and married for 21 years to my f-bombing assistant (aka) fizzy bomber. 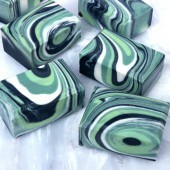 I am a bath lover by heart and take one every night for as long as I can remember. For those that have boys can relate, there is not much girlie time left in the day. Bath time was and is my oasis. 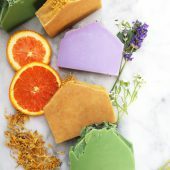 After being fed up with breaking out with store bought bath products, I looked into making products for myself and also for Christmas presents. 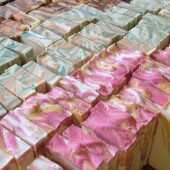 Over 8 years ago I made lotion bars and people loved them. I was inspired to make more things. 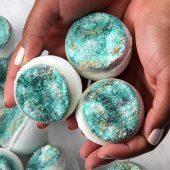 I learned how to make bath bombs and never bought store bought stuff again. My skin felt amazing, no more itchy dry skin or irritations! I started making 3 to 4 batches a week and would get half to come out and the others went into a big bucket of failure. Either too dry, too wet, pockets full of unmixed dry ingredients. Ugg, the frustration was real! I learn to spritz, spritz, spritz and mix, mix, mix. I took notes over the years including information on the temperature and how much moisture was in the air. 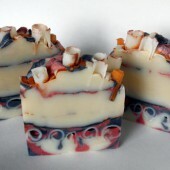 Was it raining or did I have a gremlin lurking in my soap dungeon playing tricks on me? I thought about baking; let’s break down the ingredients like we would a homemade cake. I took my Kitchen Aid Mixer and put the paddle on like when mixing flour. Only this time I added my dry bath bomb ingredients to make sure they were broken down and blended well. Next, I melted the butters and oils and let them cool for a bit. Then, I added the bonding agent that will bind the two together (the water and alcohol). Instead of spritzing, I dumped it in. I found when spritzing you could not control how much was coming out in each spray. 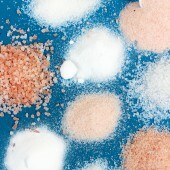 On the right is Holly’s Rose Mint Bath Fizzy, and on the left is her Energy Bath Fizzy. People ask me all the time if I have a machine and the answer is I have no machines, only a meat baller and my assistant. We can produce over 2,000 fizzies a day and not have one batch fail. Consistency is the key. I borrowed a machine to test my recipes for the book, but found we were faster than the machine. What kind of alcohol do I use? I use at least 70 percent. The higher the alcohol makes it evaporate out and leave a nice hard fizzy. Why dump it in? What about the fizzing reaction? As soon as I dump it in I turn mixer up for a few seconds to get it to incorporate and the fizzing action stops then lower down on a slower speed. What about humidity? I have made them in Texas, Alabama, Missouri, Tennessee, South Carolina, New York and have no problems. Some even in hotel rooms! I would keep them in a draft free place away from air conditioning, swamp coolers and open windows. When and how do I incorporate color to the fizzies and have a consistent color? 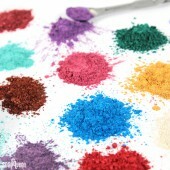 I add liquid color to liquid ingredients and powder colorants to the dry powder ingredients. Packaging for outdoor markets in high humidity areas I would shrink wrap them only after they are completely dry. If not they will hold moisture and will end up soft over time. Now to the fun part…let’s make some fizzies! 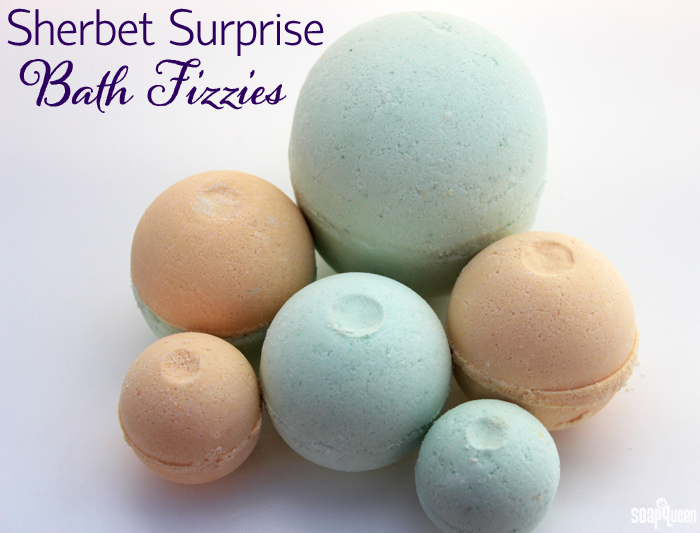 All the rage right now is bath fizzies that shoot out a rainbow of colors. 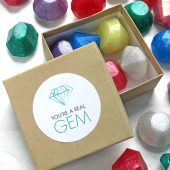 I will show you how to make a bath bomb with a surprise color inside. These can be called mystery bath bombs. You never know what you will get until it hits the water and the center color is revealed. Kids love them and think its magical. 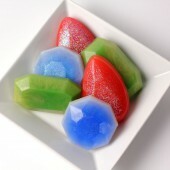 You will make this recipe 2 times; once to make the center mini fizzies and once to make the big outer one. Please note you will make lots of small fizzies for multiple batches; You will not use all of them in making these. You want the inside mini fizzy hard so it will keep its shape inside the big one. ONE: Mix all the dry ingredients (baking soda, citric acid, arrowroot powder) together in a small mixing bowl. Blend well to break down any chunks and set aside. 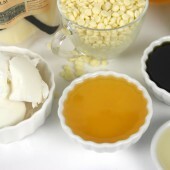 TWO: Mix the shea butter and jojoba oil and melt in a double boiler or microwave until completely melted and set aside. Next mix water, alcohol and fragrance oil in a small bowl. When the butter and oil have cooled slightly, combine the water mixture and oil mixture together. 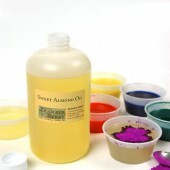 Add 2-3 tsp of the Adobe Brick La Bomb color to the liquid and stir. 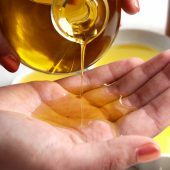 THREE: Using a hand or stand mixer, pour the oils into the dry mixture and increase speed slightly (one notch), making sure to mix well. Turn mixer down to low, mixing for an additional 1-2 minutes. 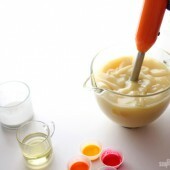 Test the mix by squeezing it to ensure it can hold its shape. Now you are ready to ball! FOUR: You can find a mini meat baller at most kitchen stores. Scoop up the mixture into the meat baller until overly full. Firmly squeeze the meat baller together and release. Gently remove the bath bomb and set aside to fully dry for 24 hours. FIVE: Repeat steps one and two. Add less of the La Bomb colorant for contrast, or leave it white. I often like to leave my outer layer white because it tricks the kids 🙂 In the photos shown, I used half Irish Green La Bomb, and half Coral Orange La Bomb. SIX: You’re now ready to mold together the larger and smaller layers. 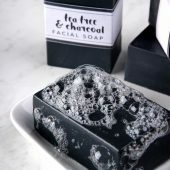 Fill one side of the Stainless Steel Bath Bomb Mold and gently place the mini fizzy inside. Next, mound the bath fizzy mixture on top of the mini bath bomb by mounding up the fizzy mixture like a snow cone. Place the other half of mold on top and press the two sides together until they touch. 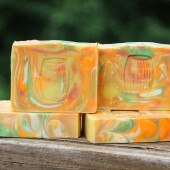 SEVEN: Turn over in your other hand and gently squeeze the flat spot on mold and lift up. 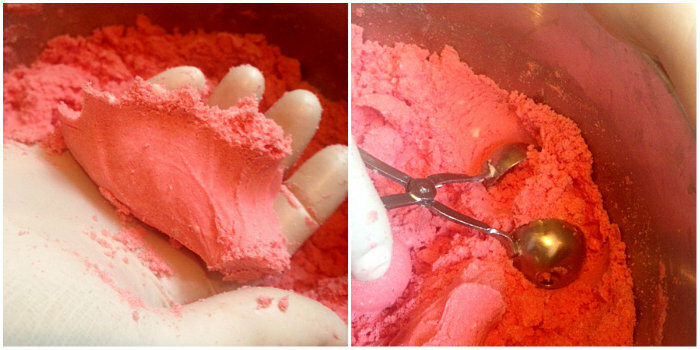 Turn the bath bomb into the other hand and gently squeeze the flat spot on mold and lift! EIGHT: Place the fizzies on bubble wrap pieces to keep the bottoms from becoming flat. Allow the fizzies to fully dry for 24 hours. Package, and enjoy! 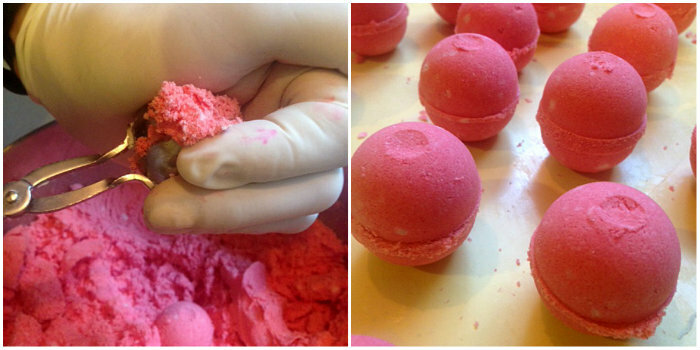 Do you have any awesome bath bomb making tips? I would love to hear them! 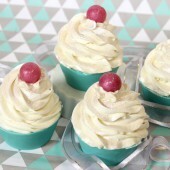 This guest recipe from Holly Port involves two layers of bath bombs for a surprise color! Mix all the dry ingredients (baking soda, citric acid, arrowroot powder) together in a small mixing bowl. Blend well to break down any chunks and set aside. 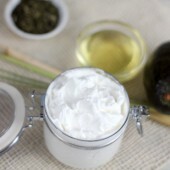 Mix the shea butter and jojoba oil and melt in a double boiler or microwave until completely melted and set aside. Next mix water, alcohol and scent in a small bowl. 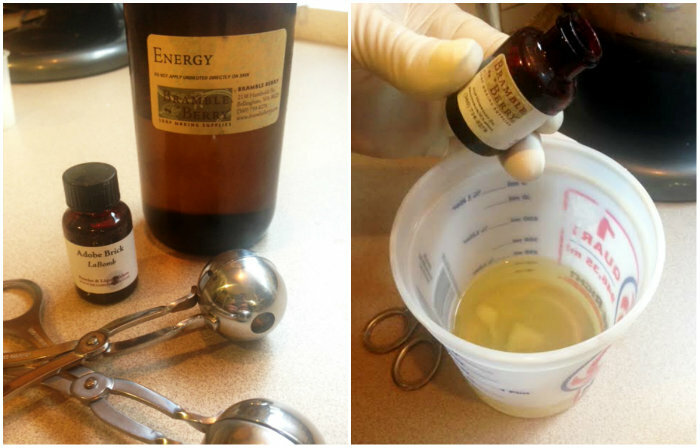 When butters and oils have cooled slightly combine the water mixture and oil mixture together. 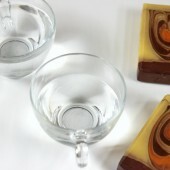 Add 2-3 tsp of the Adobe Brick La Bomb color to the liquid and stir. 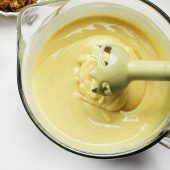 Using a hand or stand mixer, pour the oils into the dry mixture and increase speed slightly (one notch), making sure to mix well. Turn mixer down to low, mixing for an additional 1-2 minutes. Test the mix by squeezing it to ensure it can hold its shape. Now you are ready to ball! You can find a mini meat baller at most kitchen stores. Scoop up the mixture into the meat baller until overly full. Firmly squeeze the meat baller together and release. Gently remove the bath bomb and set aside to fully dry for 24 hours. Repeat steps one and two. Add less of the La Bomb colorant for contrast, or leave it white. I often like to leave my outer layer white because it tricks the kids 🙂 In the photos shown, I used half Irish Green La Bomb, and half Coral Orange La Bomb. You’re now ready to mold together the larger and smaller layers. Fill one side of the Stainless Steel Bath Bomb Mold and gently place the mini fizzy inside. Next, mound the bath fizzy mixture on top of the mini bath bomb by mounding up the fizzy mixture like a snow cone. Place the other half of mold on top and press the two sides together until they touch. 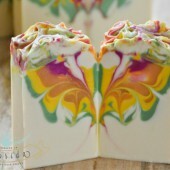 Turn over in your other hand and gently squeeze the flat spot on mold and lift up. 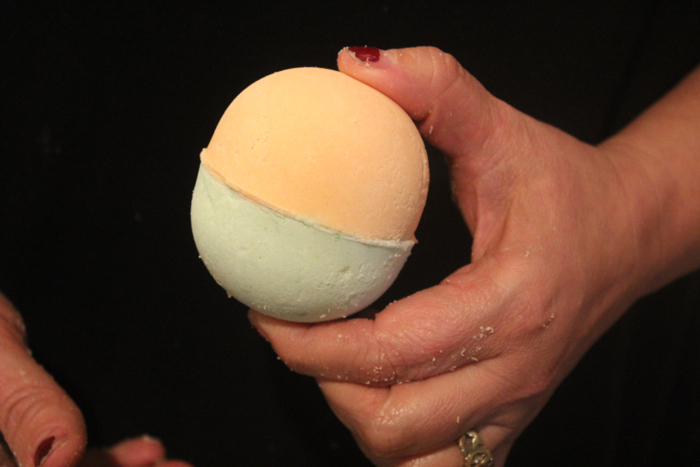 Turn the bath bomb into the other hand and gently squeeze the flat spot on mold and lift! Place the fizzies on bubble wrap pieces to keep the bottoms from becoming flat. Allow the fizzies to fully dry for 24 hours. Package, and enjoy! 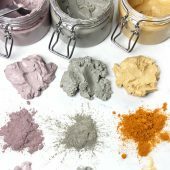 The color does wet the mixture a bit, so if your bath bombs are dry you can add more oil or alcohol until it’s the texture of wet sand. 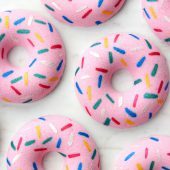 Im new to bath bomb making. I have a recipe that worked pretty well using a silicone mold the first time around. Since then I have tried it two more times and they bombs will not come out of the mold in tact. Im not sure what is different other then I doubled my batch and maybe the air moisture is different. Any thoughts? Also, have you ever tried to reuse the material from a failed batch successfully before by remoistening and mixing? I did this once and it sort of worked but Im wondering if it isn’t really a waste of time. I am wondering if Tapioca could be use instead of Arrowroot? 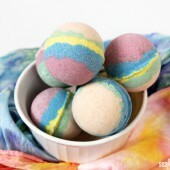 Hi there, I have been making these bath bombs lately and love them. I just want to be sure the 3 tbsp of fragrance is correct. I do find the scents strong, which I like, but I do worry about them being too strong. when I use the bramble berry calculator, it suggests using 1 Tbsp. 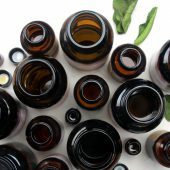 Will the 3 tbsp cause irritations? 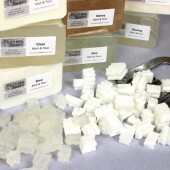 Also does the arrowroot powder leave a film in the tub? It sounds like they may be a bit dry! Are you using any witch hazel to wet them? Also, because tablespoons are volume and ounces are weight, it can be tricky to convert them. I would recommend using a scale to measure those ingredients out! thanks, but something seems off in this recipe i dont know if it is a typo or that is the way it should be. 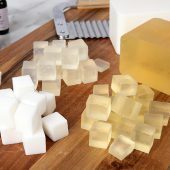 Ah-ha, I have Holly s book and have made several batches of the Basic Recipe and was using .5 water and .5 rubbing alcohol to make 1 ounce….I just found out from the previous post that it should be 1.5ml. Would this explain why my bombs are soft after 48 hours? I can leave finger indents when pressing on the bomb. I am going to give this arrowroot recipe a go and see if I can get a harder bomb. I was able to shrink wrap the bombs, but they did flake off while adding to shrink wrap bags. 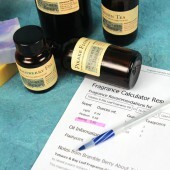 To find out how much fragrance/essential oil to use in your bath bomb recipe, you can use the Bramble Berry Fragrance Calculator. Select the “Salts” option. Then, input how much bath bomb mixture you’re making (baking soda + citric acid + additional ingredients). 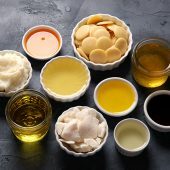 Select the fragrance or essential oil you’re using and the calculator will tell you how much fragrance to use in your recipe. 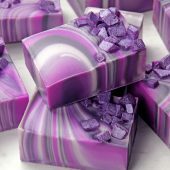 The Fragrance Calculator uses weight measurements, while some bath bomb recipes use a volume measurement, like cups. If your recipe is measured by volume, you can use your nose to determine how much fragrance to add! I like to add a couple drops, mix and then smell. If you want it a bit stronger, you can add more. Do you know why the alcohol is mixed with water? Is it because of the smell or another reason? It’s just that I live in quite a damp climate and was wondering if I might have more success if I leave the water out and just used rubbing alcohol or witch hazel. Love the way the bath bombs are wrapped (upper pictures) in the patterned paper. Is that just regular tissue paper, or is it waxed? BEST RECIPE EVER! I have tried so many different recipes, and they have all been ok, but this one was great! I made a few adjustments, but for the most part stuck to this recipe. The ones i made even make a nice foam! lovely. thank you for sharing. I made these tonight and had difficulty releasing them from the stainless steel mold (purchased at BB). The first bomb popped out like a charm, but the rest wanted to stick and not release. I feel like I’ve read somewhere about coating the molds first. Any helpful tips on what this magical substance might be? I’m so tired of only yielding half bombs. 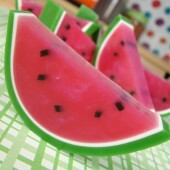 I love this recipe easy to mold and take it out of plastic mold. I made with different color and its look awesome. I can keep this product outside and totally fine still hard and smell great. I have been searching and searching since I read this when it came out, … any idea where you can buy a meatballer online?!!! Thanks I will try Amazon (again, have not had luck with them so far), but, .. ummm, … you may want to remember Not everyone lives in cities! We don’t All have “kitchen supply stores” to visit! I’m sure you are right, and if I had one I could go to I would have looked there already. I suspect generally if someone tells you they’ve been looking for something really hard online it is because where they live there isn’t a big selection of the kind of thing they are asking about. Sorry, … may help another time? I tried this recipe and I loved it! 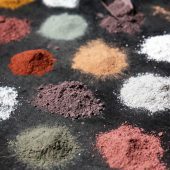 I want to try them with micas as well, and I do have Poly 80, but I have no idea how to incorporate into this recipe. Should I remove some liquids or add some more dry ingredients? And also, how much mica would you recommend to use if you want to color the water? 🙂 Thank you so much for posting this recipe! Did your polysorbate work? How much did you use? 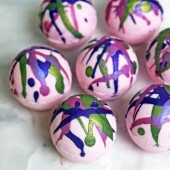 Holly’s bath bombs are so pretty and look so easy to make! I’m not sure of the .05 oz water and alcohol measurements. Does that mean 1/2 oz (.50)? Also, .05 oz. is a very small measurement (smaller than .5 ounces). It is about 1.5 mL, that may help clarify! You can use our droppers to measure in mL amounts. Thank you so much for the measurement and the link! 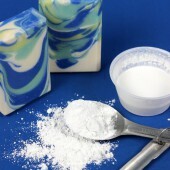 In her book, Make it Fizz, page 12, it uses the same ratio of powdered ingredients with 1/2 oz water and 1/2 oz alcohol. I’m still trying to figure out which measurements are weight vs volume (is the jojoba oil measured on the scale, or pipettes)? I’m used to soaping where it’s all by weight. 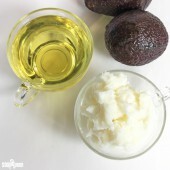 This recipe is mixture of weight and volume! For instance, the citric acid and baking soda is measured in cups, which is a volume measurement. 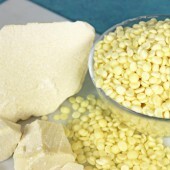 However, the shea butter, water and alcohol are measured in ounces, which is a weight measurement. So, it would be helpful to have a scale for the weight measurements. The rest you can do with measuring cups. I’m sorry for the confusion! It can definitely be tricky to know the difference between weight and volume measurements. The book says 1/2 oz water, not .05 oz. That’s a big difference! I just used the book recipe and they are very moist. Guess I’ll see how they dry! I’ve been to three big box stores and four drugstores. I can’t find 99% isopropyl alcohol. Highest I can find is 70% and 91%. Any suggestions? Loving the book! I finally got my bath bombs to stay together! I’ve had them for a few days, but they have developed light brown spots/specks on them. I used the la bomb coloring. Do you know what this is and how to avoid it? Could it be mold? So glad you’re loving the book! I’m wondering if those little spots are fragrance discoloration. If you’re using a fragrance with vanilla, it can discolor your bath bombs. What fragrance did you use? 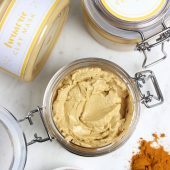 i would love to try this recipe and have almost all ingredients except for the arrowroot powder, is there a replacement for it? 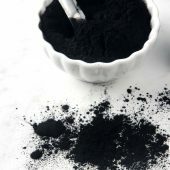 Tapioca powder would be a good substitute for arrowroot powder! 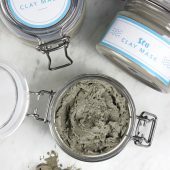 You can also try a clay, like kaolin clay. Does anyone know what size meat ballers she uses? Small and large? I have the stainless steel mold, but would love to try the meat ballers mentioned. Does anyone have both size dimensions? Thanks! Can you please share one hard bath bomb recipe please. How many would you say this recipe makes? I get it that you make small ones first and you end up having extra for multiple batches, but when you make the second part of the recipe, how many big ones do you get? Using that exact mold? Also, what can I substitute for jojoba oil? 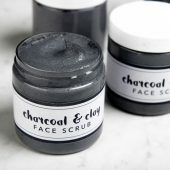 Or can I just use Shea or Cocoa butter? 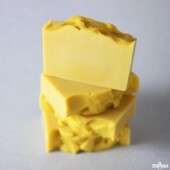 Also, you can use shea or cocoa butter if you like! 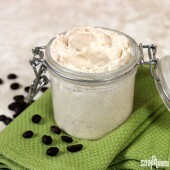 Meadowfoam oil is another great substitute for jojoba oil. 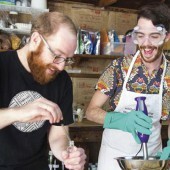 This was a very interesting article, as is the recipe. Thank you so much for inviting this lady onto your blog and to her and you for sharing it! I was particularly curious about the use of arrow root powder in the recipe given. up until now I only ever saw this ingredient used in dry applications. I presume it makes the fizzies lovely and hard, and probably makes the water feel soft, does it add any beneficial skin properties to the bath? 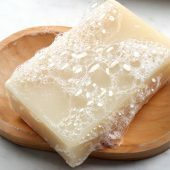 I will try using it in some of my bath fizzy recipies because I am very interested to see the difference it makes (at all stages) first hand. 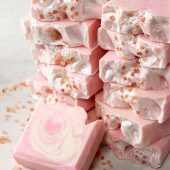 But if I decide to add it to the recipes for the fizzies I sell I will want to explain the qualities it brings (as I do with all my ingredients)to a bath,in my product description. 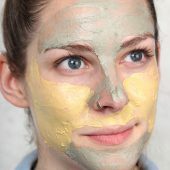 So I would love to know of any benefits bathing in arrow root may have please. Thank you once again for another informative and inspiring post, … this one Really got my imagination going! You’re welcome, glad you enjoyed the post! 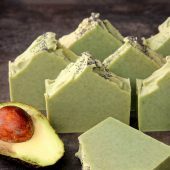 Arrowroot powder is added to this recipe to help with the texture of the bath bombs. It helps make them a little more firm and stay together. 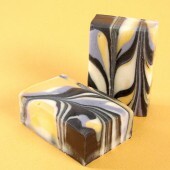 As for skin benefits, it does feel nice and silky. Hey, its my soapin’ sister! Holly is THE BATHBOMB QUEEN! She has come to Texas on several occasions and made these puppies even in our hot-humid summers. 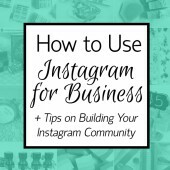 Her book is excellent and is great for providing fun-fizzing inspiration! Great feature and post! 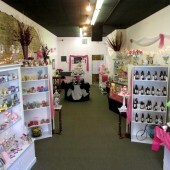 <3 me some Holly Port! I too have this book, I love it and it is the best resource for this that I have seen. Thanks for the nice spotlight story and the fun recipe. This is awesome!! 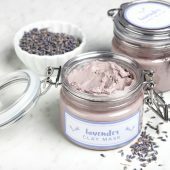 I love Holly’s book, and now I just have to make secret centered bath bombs! Oh oh!! I know what I’m going to do tonite! 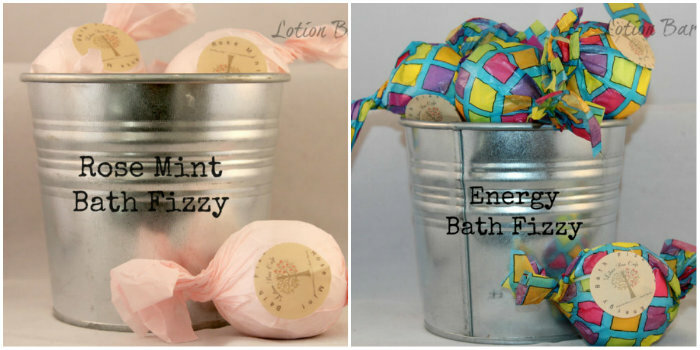 MAKE BATH BOMBS! !